Even the healthiest shrubs and trees planted in the most ideal conditions need a substantial amount of time, care and proper irrigation to become established in the landscape. During the establishment period, roots are reaching out into the landscape soil, and shoots and trunk grow more slowly than they did before transplanting. An established plant has developed a root system substantial enough to keep it alive without irrigation. If you cannot plant trees or shrubs on the day they arrive at the planting site, keep them in an area that is shaded and screened from the wind. After the plants leave the nursery, they should continue to receive the same amount of water at the same frequency the nursery provided. Depending on how the root balls are contained, certain watering requirements need to be met. Container-grown trees and shrubs dry out very quickly. Even one day without water can cause significant root death. Several days without water could mean death of the entire plant. These plants may need to be watered daily in warm weather, possibly even twice daily during hot, dry spells. In cooler weather, every other day may be sufficient. Balled-and-burlapped (B&B) plants that have been freshly dug require more water than B&B plants that are hardened-off (able to withstand full outdoor exposure). Surround root balls of all B&B plants with soil, compost, mulch or sawdust to help prevent roots from drying out. Water slowly and thoroughly, using a hose or sprinkler. Be sure water is thoroughly soaking the root ball. Do not allow root balls to stand in water after they have been saturated. Depending on temperature and rainfall, repeat this process until planting. Many plants die from too little or too much water during the first few months after planting. Those in well-drained soil are likely to get too little water, while those in poorly drained soil get too much. Determine when and how much to water by becoming familiar with the characteristics of the planting site and then striving to maintain constant moisture in, but not saturation of, the root ball. The proper frequency and length of watering is rarely the same from one site to the next. The moisture level in the root ball is the deciding factor of whether irrigation is being correctly supplied. Problems may arise if newly planted shrubs or trees are irrigated by systems designed to water turfgrass, flower beds or established plants. In well-drained soil such systems cannot supply enough water to the new plants without overwatering everything else and wasting water. Water these new plants by hand with a hose or with a temporary micro-irrigation system designed specifically for them. In poorly drained sites, shrubs and trees planted in or near regularly irrigated turf are especially susceptible to overwatering. 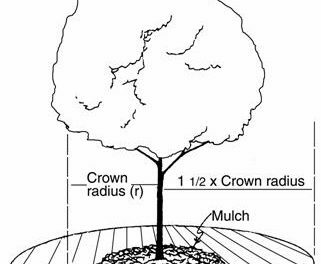 Irrigation water and rainfall run over the soil surface and collect in the looser soil of the planting hole, drowning the tree’s roots. 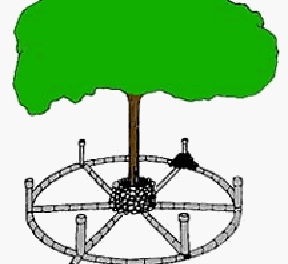 Three possible solutions include: (1) Locate new shrubs and trees away from the lawn and its irrigation system in their own specially irrigated beds; (2) Adjust the turf irrigation system so the root balls of the new plants do not become saturated (this may result in underwatered turf); (3) Plant the shrub or tree slightly higher than surrounding soil (this keeps the top portion of the root ball out of the standing water in the planting hole). To maintain rapid growth, shrubs and trees transplanted into well-drained soil require daily irrigation for at least the first month. Frequent irrigation benefits the transplanted shrub and tree more than large volumes of water infrequently applied. In poorly drained soil monitor the site for changes in moisture levels caused by rainfall or runoff from adjacent irrigation. The root balls of newly planted trees and shrubs must not be allowed to dry out, nor must they be saturated. Root growth is slow on shrubs and trees that are not irrigated regularly after planting. Such plants will normally stay alive until a drought occurs but can die back during the drought. Regular irrigation in loose soil promotes the extensive root system that is a plant’s best defense against drought. If proper irrigation cannot be provided following planting, consider planting smaller trees or shrubs that establish more quickly. Trees or shrubs planted in cooler weather may need less water, depending on the weather and soil drainage. Those planted in compacted or poorly drained soil with a portion of the root ball above the surrounding soil may need more water because of the drying effect of the mounded planting. Trees or shrubs mistakenly planted too deeply in poorly drained soil should not be irrigated until they are raised and replanted. To determine whether the amount of water being supplied is adequate for the site conditions, conduct the following tests. Within the first week after planting, gently dig a small hole in the loosened backfill soil just outside the root ball and half its depth. Do this several hours after watering. Squeeze soil taken from the bottom of the hole in the palm of your hand. If water drips out between your fingers, you are watering too much; if soil crumbles and falls out of your hand as you open your fingers, you are watering too little. If soil stays together as you open your fingers, moisture in the backfill is just right, but the root ball might be bone dry. Poke a finger into the root ball to check the moisture there. If it feels dry, increase the amount of daily irrigation. If you can squeeze water from it, it is too wet. With practice, these techniques become quick and easy ways to evaluate soil moisture.